Christmas tradition | Where's my backpack? 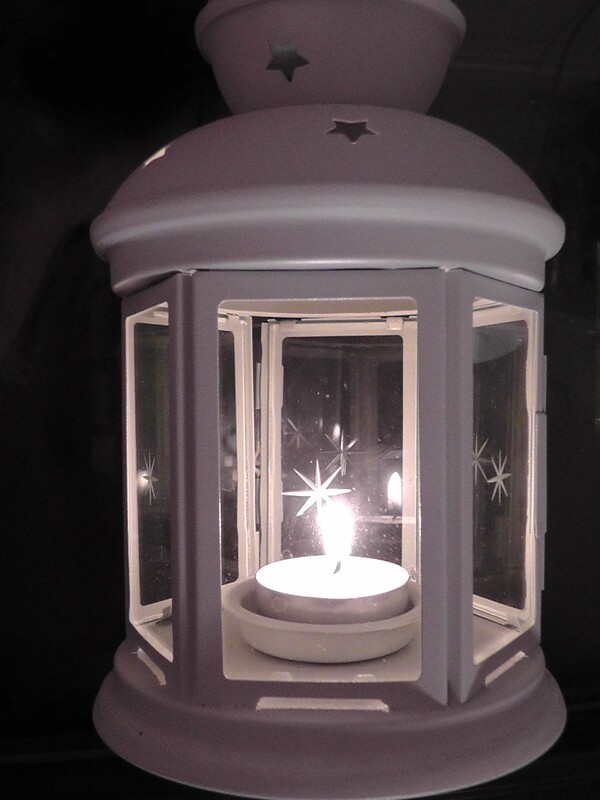 There are some Christmas traditions in Ireland that stand the test of time, like the tradition of leaving a candle burning in the window on Christmas Eve. Some believe it to be a symbol of welcome to Mary and Joseph who sought shelter on the very first Christmas Eve. To have no light in your window means you share the guilt of the innkeeper who turned them away. Another story surrounding the tradition stems from the time when Ireland was under English rule and saying mass was outlawed. The candle in the window served as a sign to priests that it was safe to say mass in that house. Should English soldiers inquire about the meaning of the candle, the Irish would say it was a symbol of welcome, as above. But many believe the tradition pre-dates Christianity and was an ancient way of welcoming the return of the light after the winter solstice. Another Irish tradition is a bracing swim on Christmas morning. The most famous spot to take the plunge is the 40 Foot in Dublin Bay. In olden days it was a men-only swimming spot and skinny dipping was the norm, but nowadays it’s open to men, women and children. Togs are now required although there’s a small area reserved for those who prefer to go swimming in their altogether, and on Christmas morning there’s usually at least one fellow taking the plunge in a Santa suit. But there’s a newer tradition that began in 2008 when the German supermarket chain Aldi first offered its run-up-to-Christmas produce bargains. 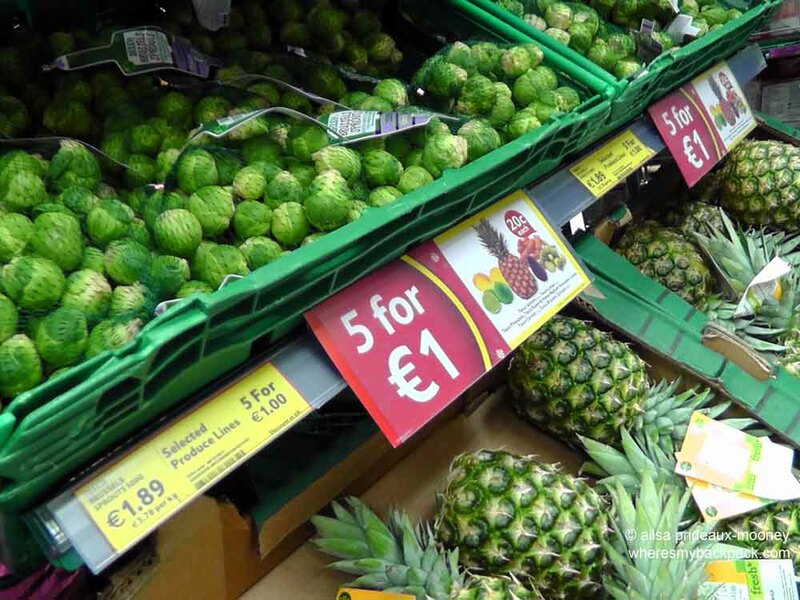 Now a whole range of supermarkets pick a handful of fruits and veggies and offer them up to the Irish consumer for almost but not quite free. Judging by the rate at which those pineapples, melons and avocados flew off the shelves, it looks like there are going to be plenty of non-traditional Christmas dishes being served up in Irish kitchens all over the country. This entry was posted in Ireland, Photography, Travel and tagged christmas, culture, current events, holidays, travel, writing. Bookmark the permalink. The candles was the best bit. Have a great christmas. What a lovely tradition!!! Happy Christmas to you! love the idea of chasing 5 cent pineapples for Crimble. I believe the SALES are starting TODAY in London town. Happy Birthday Baby Jesus! Merry Christmas, Ailsa – thank you for sharing the traditions with us! Thanks for sharing the traditions! As one said before me: They can keep the Brussel sprouts! Wow! Hope the markdown tradition moves to the States as well! Merry Christmas! Merry Christmas Ailsha, I look forward to many more challenges from you in the New Year! Wow! My fruit-loving daughter would love this new tradition. We always have (fake) candles lit in our window all Christmas season. I didn’t know the story behind it. It’s just one of those common Christmas decorations that we’ve always seen and liked. Merry Christmas Ailsa! I guess this is the best time to stock up on those Brussel sprouts. Just kidding, I mean the pineapples. Haha, that made me laugh, yeah, you don’t expect to be greeted by pineapple when you arrive home for the holidays! Oh, yes, and those jumpers are terrifying, especially the ones with a maniacal-looking Rudolf with a red flashing nose. Gulp! Saw a few of those too! Thanks for sharing Christmas from across the world ! Love your Blog Ailsa ! We shall make it so Ailsa!